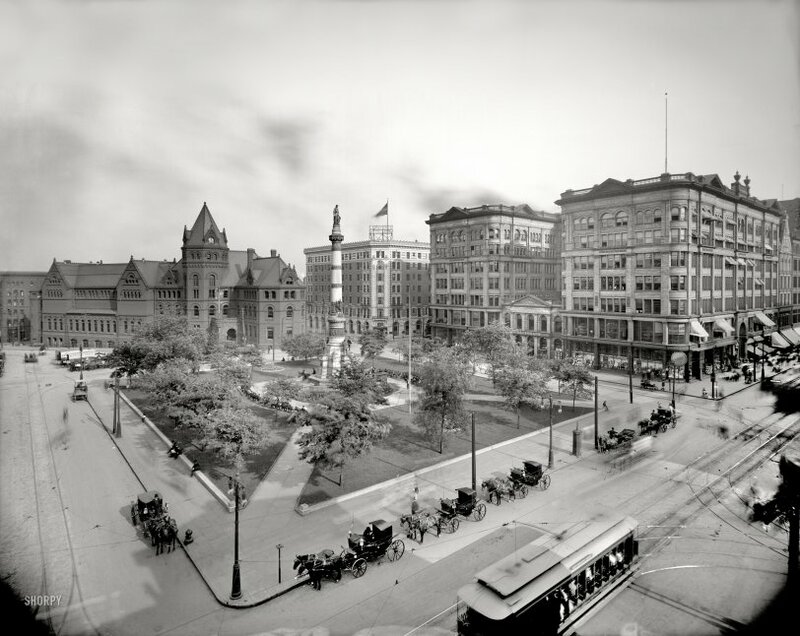 Buffalo, New York, circa 1905. "Lafayette Square." 8x10 inch dry plate glass negative, Detroit Publishing Company. View full size. Submitted by Lockportny on Tue, 06/26/2018 - 8:45pm. Where is the smoke coming from? It looks to be a warm summer day, so it wouldn't be from furnaces in the buildings. It seems to originate on top of the building between the Hotel LaFayette, and Kleinhans. Or, is it some kind of smudge on the photo plate? And, did no one ride horses in the city? Or, did no one ride horses downtown? I don't see any riders in any downtown photos, and I don't see where you'd tie one up. All I see s carriages and cars and streetcars. If you go to Buffalo, do check out the renovated Hotel LaFayette. Its gorgeous! Submitted by JoelAK on Fri, 02/10/2012 - 11:16am. Here's an update to the previous post about the rehabilitation of the Hotel Lafayette. I appreciate that their original 1905 sign indicated that the hotel is "Fire Proof". Sleep in safety! As a side note, the hotel was designed an built by the first accredited female architect in the AIA, Louise Blanchard Bethune. Submitted by Edisone on Sat, 01/21/2012 - 3:03am. Not a call box, although many had telephone connections in a box OUTSIDE this "booth". These were used by walking patrolmen as one-man jails. A rowdy would be stuffed inside, locked up, and the paddy wagon sent for. They were at various intersections all over Buffalo, until about 1940. See photo and caption here. Submitted by djh on Mon, 01/16/2012 - 11:56am. I wonder if Kleinhans wouldn't sell their building, so they built the U-shaped New York Life building around it? Submitted by MrK on Fri, 01/13/2012 - 1:11pm. Very nice find. 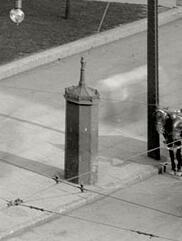 Makes sense now, following that wire to the fire pull box with this police call box makes sense to bundle the wires and be routed back to the same place. Darn that Chameleon circuit, looks like it will never get fixed! Submitted by grubemed on Fri, 01/13/2012 - 7:52am. This is a police call box. Very common at the time. I've attached a picture of a rather more ornate one, but of the same general layout. I think the wire DOES go to the box, for the telephone inside. Submitted by Histry2 on Thu, 01/12/2012 - 8:57pm. The large cannon at left center is a Civil War-era Parrott Rifle, named after its designer Robert Parker Parrott. These were cutting edge when introduced in 1861 and came in variety of sizes. Both the Army and Navy used them up through the early 1890s. This particular Parrott seems to be a big one, possibly a 200 pounder, meaning it could fire a pointed shell weighing 200 pounds. Military technology moved swiftly in the late 19th century and Parrotts were phased out as more modern artillery came into use. Many obsolete Parrotts and other Civil War cannon ended up as martial ornaments in city parks and military cemeteries. 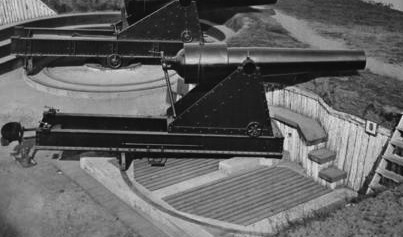 The scrap drives of World War II took a huge toll on ornamental cannon. Wonder if this Parrott survived? Submitted by Chip on Thu, 01/12/2012 - 7:38pm. Submitted by M2 on Thu, 01/12/2012 - 3:54pm. but a year later, on July 4 1906, Buffalo would record its first instance of a pedestrian being fatally mowed down by one of the infernal machines when Henry A Ward, founder of Ward's Natural Science Establishment (and taxidermist of Jumbo the Elephant mount fame) succumbed. Submitted by MrK on Thu, 01/12/2012 - 5:48pm. But I have never seen them in old photos such as here. Is this a pissoir? Something for the horse buggies? Fresh water? Something for the drivers to "dispose" certain things of? I see that Dave, thanks! Missed it the first time. Also, looking at the shadow, the object looks like it does not have the same dimentions all around. Looks wide, but not deep according to the shadow. The photo here on the page is a little too low res to discern where the wire goes or what it is connected to (Dave can you help?). I see what appears to be a fire call box on the furthest trolley pole in that block corner. Submitted by switzarch on Thu, 01/12/2012 - 8:35pm. That at least two of the major buildings has survived. What was that glorious masonry gem on the far side of the Square? Submitted by Splunge on Thu, 01/12/2012 - 1:18pm. and the bystanders are less ghostly and considerably less well-dressed. Submitted by Dutch on Thu, 01/12/2012 - 12:47pm. I had no intention of commenting until something struck me as humorous in the building on the right hand side. I would bet that the New York "Life Insurance" company did not appreciate one of their employees perching himself in an open fourth story window. Submitted by Larc on Thu, 01/12/2012 - 12:19pm. in the center of the shot in currently undergoing a $35M-$40M renovation that will result in one and two bedroom apartments and up to 50 hotel rooms, as well as several businesses on the ground floor. The exterior and much of the interior are being painstakingly restored to their original appearance. Target date for completion is May 1. Submitted by rgraham on Thu, 01/12/2012 - 11:32am. The depth of field and scope of the lens have created one of the coolest looking images yet seen. Great job of scanning to maintain the effect. I feel like I'm looking out a window onto the actual scene. You can't park that here! Submitted by ChrisL on Thu, 01/12/2012 - 10:44am. Parking next to a fire hydrant is illegal!